A new proposal by the Department of City Planning would allow commercial buildings throughout the city to be topped with rooftop farms or greenhouses without increasing the building’s floor area ratio and height restrictions. According to a study by the Urban Design Lab, this amendment could bring almost 1,200 acres of rooftop farms to the city. The zoning proposal was spurred by the popularity of rooftop farms such as the expanding Brooklyn Grange. The rooftops in question were previously out of reach for rooftop development, as the addition of roof farms or roof structures would violate the commercial building’s allowed space capacity. The unused rooftops have literally been going to waste for years, but with the introduction of green roof farms everyone can benefit. The lease holder can enjoy rent or tax breaks from the occupying farm, more fresh produce can circulate the local area, and the green roof will block solar gain and filter rain water, reducing the building’s energy usage. The DCP’s green initiative does not just stop at allowing agriculture. The amendments would also allow the existing buildings to become more energy efficient and reduce their carbon emissions through green building techniques. This would include building energy efficient walls, installing solar panels or rainwater filtration systems, and adding louvers or other façade additions to help filter sunlight. Best of all, the proposal also allows some buildings to install wind turbines on roofs to offset energy usage by generating clean power. It would also encourage electric vehicle charging in parking areas, as well as battery swapping facilities. This exciting proposal could pave the way to a much green future for New York City. The amendment is currently undergoing the public review process, which will be complete on February 12th. This won't "pave the way to much greener future in NYC", it will DEpave the way to a greener city! @MrNewYork: I don't think the new rules allow pot... @zaki: ideally irrigation runoff would be captured and reused. Chemicals should be minimized via organic practices. Green/living roofs are technical systems designed and installed specifically to prevent water leaks, root penetration and to support living systems. for more info consider taking my class this spring: http://www.citytechce.org/introduction-to-green-roofs-and-living-walls.html I'm also going to be offering a Skillshare class on this topic soon. What about runoffs from irrigation and chemicals? Won't they cause corrosion and seepage to the floors below? Please respond. Very interested. This is great. Grow greens, tomatoes, peppers, okra, pot, carrots, salad greens, and on and on. Fresh, less expensive. The only problem I see would be the necessary water; it is so hot up n the roof. A new proposal by the Department of City Planning would allow commercial buildings throughout the city to be topped with rooftop farms or greenhouses without increasing the building's floor area ratio and height restrictions. According to a study by the Urban Design Lab, this amendment could bring almost 1,200 acres of rooftop farms to the city. 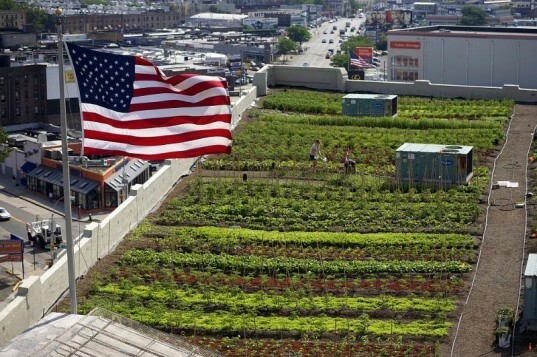 The zoning proposal was spurred by the popularity of rooftop farms such as the expanding Brooklyn Grange.